Breaking News! Fred Flinstone Fired From Fruity Pebbles! Say it ain’t so! First Twinkies retire and now this? 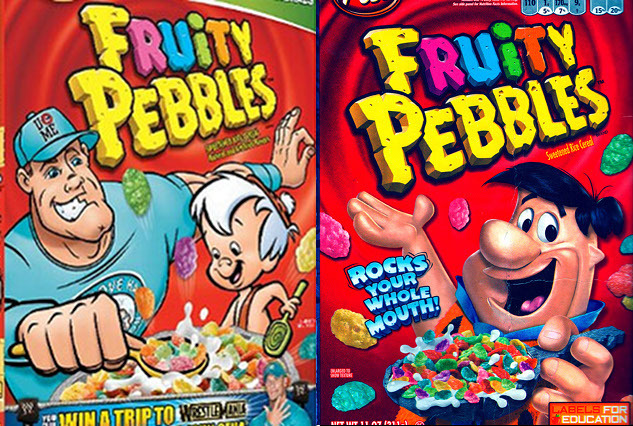 WWE wrestler John Cena is replacing Fred Flintstone on the Fruity Pebbles cereal box because “Fred isn’t necessarily the … coolest or [most] relevant guy for kids who we are going after,” admits Post Cereals marketing director, Sharon Pupel. So instead they’re slapping John Cena’s mug on four million boxes starting this week as part of a special promotion. Maybe it’s a good idea to get used to this? This entry was posted in World News and tagged BREAKING NEWS, fired, Fred Flinstone, Fruity Pebbles Box, John Cena, Post, Post Cereals, WWE. Bookmark the permalink.